First, the trade data showed a significant negative swing in the trade balance to a deficit of $516 million in July from a $1.6 billion surplus in the previous month. This came amid steady trade growth; export growth of 8.3% year-on-year and import growth of 10.5%, both little-changed from their pace in June. The cumulative trade balance of a $2.9 billion surplus in the first seven months of the year compares with a $7.5 billion surplus a year ago. The trade surplus is on track to narrow in 2018 for a second straight year. The annual surplus narrowed by $6 billion year on year in 2017 to $15 billion. At the year-to-date pace, we anticipate an $8-9 billion full-year narrowing in 2018, with the potential escalation of a global trade war also boding ill for exports and the trade balance in the rest of the year. This is negative for the Thai baht. 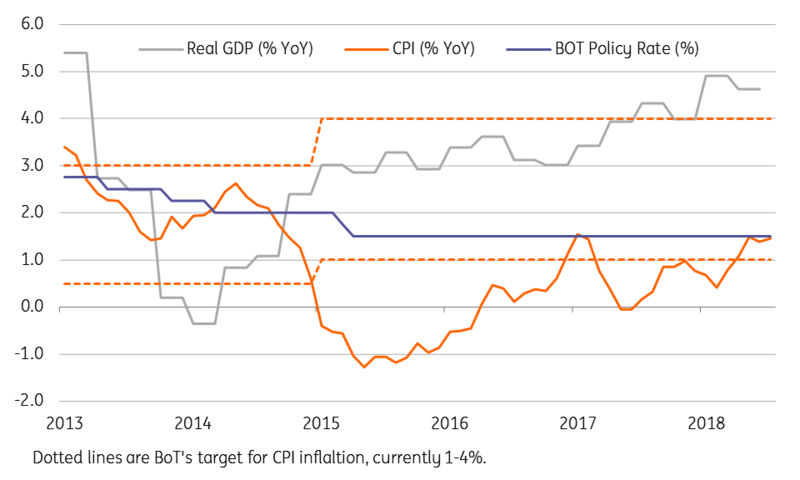 Second, the Bank of Thailand’s minutes of the policy meeting held earlier this month revealed that policymakers pondered over the timing for monetary policy normalisation. However, the timing depends on continued economic growth and inflation ‘firmly’ in the target range of 1-4%. In his response to better-than-expected 2Q18 GDP growth earlier this week, BoT Governor Veerathai Santiprabhob signalled the unwinding of an 'extremely accommodative stance'. This has set the positive tone for the THB. However, the central bank’s optimism on growth and inflation remains at risk. Growth eased to 4.6% in 2Q18 from a five-year high 4.9% in 1Q18. The high base effect together with still-weak domestic demand and the global trade war could push it below 4% in the second half of the year, imparting a downside risk to the BoT’s 4.4% forecast for 2018. And absent a food or oil price shock, inflation is likely to slow below the BoT target in coming months. Unless it’s simply to create policy space for the future or to prevent the currency from weakening, the economy isn’t screaming for monetary tightening just yet. We maintain our view that the BoT will keep policy on hold for the rest of the year. We need to see a significant shift in consensus within the BoT policy board in favour of tightening, from the 6-1 vote for no change at the last meeting, before revising our forecast. Our view of the THB depreciating to 35 against the USD by end-2018 assumed a continued narrowing of the trade surplus and potential escalation of the US-China trade war weighing on the currency. However, the THB has returned to be among Asian outperformers since July, from the worst-performer in the second quarter of the year. This together with the fact that the central bank (BoT) is already deliberating tightening, prompts a revision of our USD/THB forecast for a smaller depreciation to 33.5 by the end of the year (spot 32.8).